One of the most important influences on the creation of The Lost World was the 1909 discovery of Iguanodon footprints by Sir Arthur Conan Doyle near his Windlesham home in Sussex. 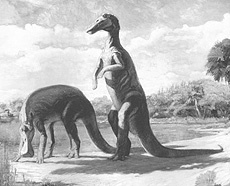 Iguanodon footprints were first discovered in the Wealden clays on the Isle of Wight in 1854 and had become a fairly common discovery by the Edwardian era. But these discoveries by Conan Doyle, while not important to palaeontology, were incredibly important for palaeontological fiction. Setting up casts in his office, they served as the final impetus to write his great boy's adventure story The Lost World. Appropriately, it was an Iguanodon trackway that the Challenger Expedition first discovers on the plateau, which - like the preserved specimens leading Conan Doyle into the lost world of his imagination - lead them to the glade where they become the first men to see living dinosaurs. Also, the first editions of the novel were adonred on the cover by an Iguanodon footprint pattern. 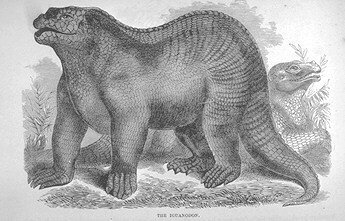 More about this can be read in the paper Sussex Iguanodon Footprints and the Writing of The Lost World by William Sarjeant and Dana Batory. 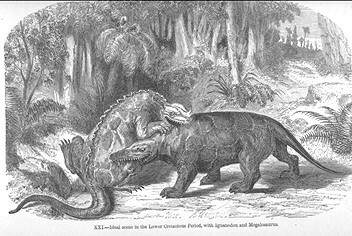 One of Conan Doyle's primary sources for The Lost World was Edwin Ray Lankester's 1905 text Extinct Animals. It was the only reference cited in the novel itself: in order to confirm Maple White's illustration of a stegosaurus to an incredulous Malone, Challenger hands a copy of the book by his "gifted friend, Ray Lankester!" Over the course of The Lost World's serialization, Lankester and Conan Doyle carried on a correspondence. The former would even suggest prehistoric animals to populate the lost plateau. 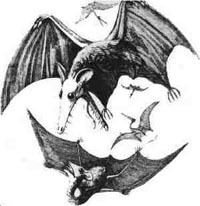 The online archives of the Universities of Strasbourg has a digital copy of Extinct Animals available for perusal. Click here to read it! An online exhibit of palaeontological papers and dinosaur restorations. Chronicling the first American dinosaur skeleton discovery. An interesting chronology of the discovery, contruction and reconstruction of Iguanodon. The prehistoric world was a lot more crowded in Victorian times. 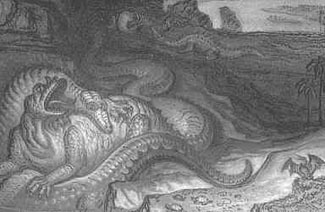 Due to artistic conventions and scientific romance of the time, recreations of the antediluvian world were filled to the brim with writhing reptilian combatants. Even when not overcrowded, dinosaurs were still seen locked in mortal combat. It wasn't until Charles R. Knight, famed painter from the American Museum of Natural History, that modern paleo-art would be born, with it's depictions of prehistoric creatures as genuine animals rather than fantasy creatures. In 1909, Charles Doolittle Walcott would discover, in the great Canadian Rockies, one of the most important palaeontological finds of all time: the Burgess Shale. Dating from 550 million years ago, the Burgess Shale site is unique in it's preservation of soft organic material, which usually doesn't get fossilized. Through this find, we have an incomparable picture of the first great diversification of multi-cellular life leading to all the organisms that came after, including ourselves. Today, one can take a special guided interpretive hike to this site, which is still offering up many surprises. The subject of palaeontology as it was understood, exercised and debated in the Victorian and Edwardian eras is an extremely broad subject. It takes books to do it justice, but nevertheless, for the casual reader it is hoped that we can give a sensible enough overview to add some depth to context of The Lost World and its prehistoric occupants. 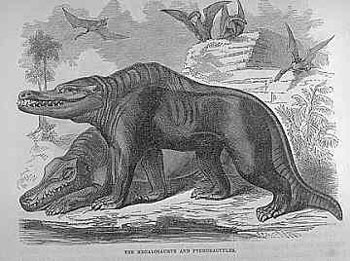 The star of The Lost World was, of course, the top predator known at the time, Megalosaurus. Described in 1824, it was one of the first dinosaurs discovered and formally named. Because of its early date and the poor knowledge of prehistory at the time, the name became a catch-all for any new carnivorous dinosaur bits and pieces that were found. With much that scrap being properly identified and categorized, we have a much clearer picture of what Megalosaurus was: a fairly large and typical meat-eater probably resembling Allosaurus. It was a robust dinosaur, and lived during the middle Jurassic period (about 175-155 million years ago) in England, France, and perhaps Portugal. The first dinosaurs the intrepid explorers come across in The Lost World are the Iguanodons. One of the most widespread and successful of all dinosaur groups, Iguanodon was also the first discovered by scientists. In the early 1820s, English doctor and amateur geologist Gideon Mantell was in the habit of investigating the gravels of nearby Tillgate Forest. It was in these gravels that he discovered the teeth and bones of Iguanodon, crediting it to his wife Mary Ann. He went on to formally describe and name the creature in 1825. 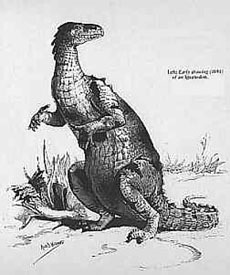 His initial suposition was that the Iguanodon basically looked like a gigantic hulking iguana, with a spike on its nose. This view more or less held until a collection of full Iguanodon skeletons was discovered in 1878. In a coal mine in Bernissart, Belgium, 24 complete Iguanodon skeletons were uncovered, as well as contless less complete specimens. This overturned Mantell's original reconstruction, which had been imortalized in the 1851 Great Exhibition at The Crystal Palace. 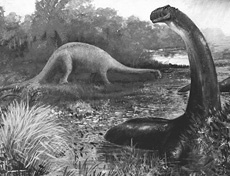 Now it was understood that Iguanodon was a more slender creature similar to many of the plant eating "duck-billed" dinosaurs that Edward Drinker Cope and Othniel Charles Marsh were discovering in the American west. This time, Iguanodon was restored standing upright like a kangaroo. As it turns out, this view is inaccurate as well. Rerestorations in the 1980s turned it back into a quadraped, walking on all-fours but capable of using its hands for food gathering and defense. Iguanodon lived in the early Cretaceous period (135-110 million years ago), and was found in England, Belgium, Portugal, Spain, Germany, Tunisia, central Asia, Mongolia, South Dakota, Utah, and northern Africa. 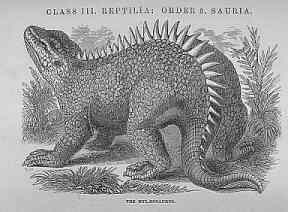 Named in 1832, Hylaeosaurus was the third official dinosaur found. This was also described by Gideon Mantell, and it too has undergone substantial restorations and recreations. The Victorian picture was based on very few skeletal remains of mostly bits of bone and spikes. Today, reconstructions and more complete specimens identify Hylaeosaurus as a nodosaur: one of the families of ankylosaur that lacks a tail-club. It lived in the early Cretaceous in England. 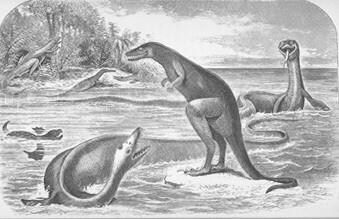 The combination of such characters, some, as it were, from groups now distinct from each other, and all manifested by creatures far surpassing in size the largest of existing reptiles, will, it is presumed, be deemed sufficient ground for establishing a distinct tribe or suborder of Saurian Reptiles, for which I would propose the name of Dinosauria. As time progressed, more and more dinosaurs were being discovered. In 1877, Archaeopteryx was discovered in the shales of Solnhofn, Bavaria. A toothed bird, this lent credence to the early theory that dinosaurs were the missing evolutionary link between birds and reptiles. Falling out of vogue in the early-mid 20th century, this theory would be reclaimed in the late 20th century with the work of newer palaeontologists and the discovery of significant finds like Dinonychus and the feathered dinosaur Sinosauropteryx. 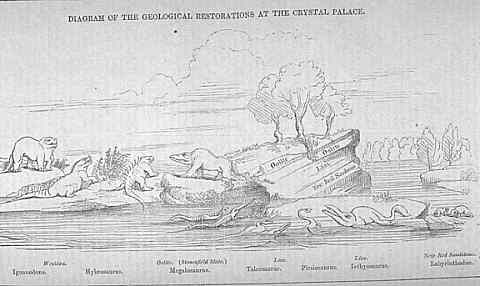 The pinacle of Victorian palaeontology (and perhaps the Victorian era as a whole, rivaled only by Queen Victoria's Diamond Jubilee) was the Great Exhibition at The Crystal Palace in 1851. As a whole, this Exhibition was intended to be a display of the British Empire's technological, industrial, scientific, and artistic advancement. New inventions were shown, cultural artifacts from across the Empire upon which the sun never set were displayed, and the crowds came to see it in droves. 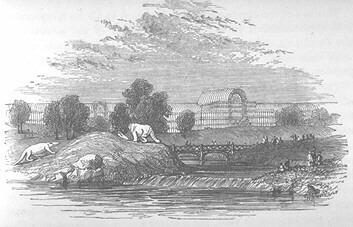 Outside of the brilliant Crystal Palace structure was the world's first "prehistoric park", featuring sculptures of dinosaurs and other prehistoric creatures, purporting to show "England before the Flood". These sculptures were created by Benjamin Waterhouse Hawkins and advised by Sir Richard Owen. The two even hosted a dinner for emminent biologists and geologists in one of the half-finished Iguanodons. Sadly, The Crystal Palace is long gone, having burned down in 1936. The Hawkins sculptures do remain however, standing to this day in Hyde Park, London. Following the Great Exhibition, Hawkins moved to America to begin work on restoring the dinosaurs being found there. 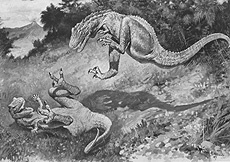 And there were a lot of them: Edward Drinker Cope and Othniel Charles Marsh were rival palaentologists who spared no quarter in their race to outmaneouver the other for dinosaur finds. This competition, involving roving gangs who would sooner destroy fossils rather than let them end up in the hands of the other crew, was called the Great American Dinosaur Rush. By the time it was over, the two scientists would together have almost completely fleshed out the Jurassic era of the American mid-west, featuring such creatures as Allosaurus, Brontosaurus/Apatosaurus, and Stegosaurus. Marsh alone collected and described over 500 new fossil species, while Cope described over 1200. Cope has also gone down in history in another way: in 1993, palaeontologist Bob Bakker formally described and published a paper on Cope's skull, which he had donated to science. Edward Drinker Cope is the type specimen for Homo sapiens. Also active at the time of Marsh and Cope was Jospeh Leidy, who was working in the American northwest and in the southwest of Canada. In 1884, Jospeh Burr Tyrrell, working for the Geological Survey of Canada, discovered Albertosaurus in what is today known as Dinosaur Provincial Park in Alberta: one of the richest dinosaur sites on earth. More towards the Edwardian era, the North American west was the stomping grounds of Barnum Brown and C.H. Sternberg, who engaged in the Second Great Dinosaur Rush. This was a much more placid affair though, not involving the violence and slander of Cope and Marsh's adventure. In 1902, Brown discovered the world's first Tyrannosaurus rex. Sternberg discovered the famous Trachodon mummy. Since the Victorian era, those initial discoveries, the Crystal Palace exhibition, the dinosaur rushes and the writing of The Lost World, dinosaurs have gone cyclically in and out of public favour. While they may go through pop-culture ebbs and flows, however, they have yet to cease amazing us like they did our great-grandparents.